The Fashion Bust team, like lots of you out there, were delighted at the news of our new Prince George Alexander Louis. To celebrate in this lovely warm weather, we’ve picked out our top maternity swimwear pieces to help pregnant women and new mums feel confident and comfortable on their summer holidays, whether that’s home or abroad, on the beach or by the pool. This pretty polka dot maternity swimsuit has fun contrast trims and medium high legs, with an internal bra shelf feature for extra support. The best feature of this maternity collection though is that it’s cut to allow for the changing shape throughout pregnancy, so you don’t have to worry about how big your bump gets! If there’s one swimsuit that we’d like to wear whether we’re pregnant or not, it’s this gorgeous Zoggs maternity scoop back swimsuit. Its sailor-inspired white, red and blue design is super cute, especially with a growing baby bump. The Blooming Marvellous collection from Mothercare is made from high quality fabric that feels soft to the touch, and the stretch in it will flatter your changing shape while you’re pregnant, so you can enjoy beach or pool time with just as much body confidence as you did before. It features soft ruching, adjustable fastenings and best of all, hidden feeding cups for nursing so you can wear it as a new mum too! This swimsuit is perfect for the last three months of your pregnancy, and features fully lined cups crafted from soft stretch fabric. We love the blue print, it’s on trend and really flattering – for stylish pregnant women everywhere! 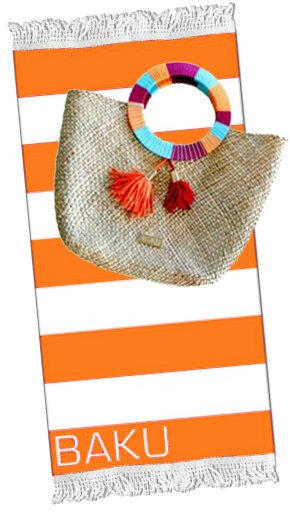 Win a designer beach bag and towel from Baku!